Box Dimensions (LxWxH) 15.5 x 13.35 x 4.95"
304A LaserJet Cyan, Magenta, and Yellow Toner Cartridge 3-Pack is rated 4.7 out of 5 by 20. Rated 5 out of 5 by ChurchBulletinLady from GREAT Have used this printer for a few years now and cartridges are great. Arrived on time and packaged well. Have ordered multiple times and will order again. Rated 5 out of 5 by Conductor from Convenient Package Instead of having to order each of the three color cartridges individually, this single package is easier and saves money. Rated 2 out of 5 by ImRed from Laser Jet Toner Cartridges I like the simplicity on installation and the quality of the product, but, the cost of these are outrageous! Rated 5 out of 5 by Dalentiff from Works great The multi pack was the best value. Rated 5 out of 5 by BowHunter from Product works Great! I have always used name brand HP Toners, and have never had any problems with them. Rated 5 out of 5 by mohlis from Great buy Great idea to offer all three items bundled together. 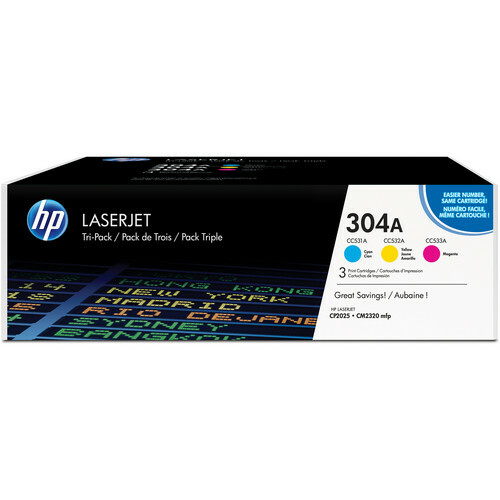 Rated 5 out of 5 by Ray124C41 from Toner Cartridges For The Best Printer/Scanner/Fax These cartridges provide toner to my HP Color Laserjet CM2320nf MFP which is without exception the best printer I ever bought. Buying them in combination for a price break is how I stock so that I'm never at a loss for a cartridge when I drive it down to the point where the printer tells me it is flat out done. I love the cartridges and the printer.